Whether you’ve got something special to celebrate or just want a really good night out with great food – you’ll find that our Protea Hotels and African Pride Hotels offer a whole host of amazing restaurants to suit every taste! From buffets to a la carte, to themed menus and gourmet burgers with out-of-this-world milkshakes, your tastebuds will be tantalised. Plus, when it comes to the bill, for Prokard Explorer members, it’s even better than dessert. Because Prokard Explorer members are entitled to some truly scrumptious savings, they enjoy great discounts whenever they dine at participating Protea Hotel restaurants – even if they’re not staying at the hotel! When dining alone, they’ll get 25% off and when it’s just two at the table, they’ll get up to 50% off the food portion of the bill. Having a Prokard Explorer Card means you eat for free when dining with others – and you can always look forward to great savings whenever you dine out! The African Pride 15 on Orange Hotel, Autograph Collection dining experience caters to each guest’s unique tastes with a restaurant and a private dining area. Enjoy the vibrant ambiance and upbeat colours of the Savour Restaurant. 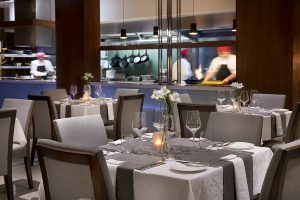 Divided into three sections, including a romantic private area, the restaurant at Cape Town Marriott Hotel Crystal Towers offers a carefully planned menu of intercontinental and fusion flavors. Situated at Arabella Hotel & Spa, Autograph Collection, this restaurant is a reflection of South Africa’s love affair with food and wine, focusing on only the best locally sourced ingredients. Private dining option is available. Our winelands-inspired restaurant will keep you coming back for more. Enliven your senses in our elegant wine cellar themed restaurant at Protea Hotel Durbanville. Escape to a world of luxury and imagination at our trendy restaurant. Exclusively different furniture and fittings and a completely open-plan kitchen make Protea Hotel Fire & Ice! Cape Town the ultimate dining experience. Our trendy menu features proudly South African dishes like jaffles and Cape Malay curry, complemented by our extensive list of organic wines and cocktails. Dining at Protea Hotel Victoria Junction Waterfront is an experience not to be missed. Protea Hotel Willow Lake’s modern in-house restaurant, serves a daily buffet breakfast, fresh specialty coffees, delectable meals and a variety of exceptional wines to complement your wildlife dining experience. Enjoy our on-site farm-to-table restaurant, plus breakfast and dinner buffets. Cocktails and appetizers are served on a deck in the reserve at Protea Hotel Hunters Rest. At Protea Hotel Kruger Gate you can experience a true African cuisine that includes game and bubbling potjies of fragrant delicacies. Food is complimented with authentic cultural entertainment. The Meadow Green Restaurant at African Pride Irene Country Lodge, Autograph Collection boasts exquisite culinary creations carefully prepared by some of the country’s finest chefs with buffet as well as fine dining a la carte options. 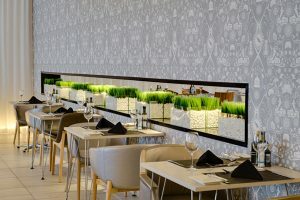 Unlike usual restaurants where food is prepared in the kitchen, Twist brings the kitchen into he restaurant with an unusual buffet style offering. Experience fine dining at African Pride Mount Grace Country House & Spa, Autograph Collection. Delight your senses at one of the best restaurants in Johannesburg. African Pride Melrose Arch Hotel, Autograph Collection is renowned for its romantic ambiance, unique ingredient pairings and extraordinary champagne breakfast. Make sure you’re seen dining at Protea Hotel Fire & Ice! Melrose Arch where we serve haute cuisine breakfasts, lunches and dinners in the limelight or backstage overlooking the pool. Flowing from the open-plan social area to the expansive pool deck, this laid-back eatery serves up everything from gourmet cuisine to tasty snack food. Protea Hotel Fire & Ice! Menlyn is by far the coolest hotspot in the city. Enjoy a full English breakfast each day and 24-hour room service. Culinary delights tempt the palate, while sundowner cocktails and scrumptious al fresco breakfasts can be enjoyed on The Terrace at Protea Hotel Midrand. The Warehouse offers fine fusion cuisine and delicacies from the á la carte menu,with dining inside and on the terrace overlooking the pool. Enjoy the intuitive service of the Protea Hotel O.R. Tambo Airport. Click here to see other participating restaurants.